Did you feel a sudden pain in your shoulder after moving your arm around over your head? Does your shoulder hurt so much that you can’t sleep on that side? Feel pain, weakness or numbness throughout your arm? Is it hard to reach up to shampoo your hair? 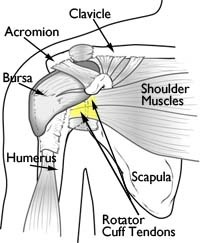 These are all symptoms of a rotator cuff injury. This injury often affects painters, carpenters, weightlifters and other athletes. Risk for a rotator cuff injury increases with age. The shoulder joint is surrounded by four muscles that form a “cuff” around the shallow socket. This arrangement allows for more mobility and range of motion, but also increases the risk for muscle injury due to sudden or repetitive shoulder movement. Lifting something too heavy over your head can over-strain your muscles and tendons. So can a sudden pull on your shoulder. Falling down on your arm or suddenly impacting the shoulder joint can cause tearing and damage. Painting or nailing above your head can also cause pain and inflammation (swelling) over time. Throwing a football or pitching a baseball too long and often will also do it. Inflammation weakens the soft tissue and makes it more likely to tear. 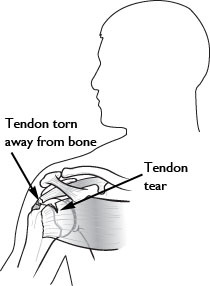 Sometimes there is a bone spur (overgrowth) that sticks out near the rotator cuff, irritating and damaging the tendon. Call Woodstown Massage Boutique at 856-769-1373 to schedule your massage session. Find pain relief today. The doctor will examine your shoulder, checking for pain, strength, mobility and inflammation. He or she may recommend an ultrasound, x-ray or magnetic resonance imaging (MRI). Your doctor might recommend a steroid injection if you are in a lot of pain. These injections relieve pain but weaken the soft tissue; they should be used carefully and not too often. If you have a severe tendon tear or pain lasting more than six months, you will most likely require surgery. 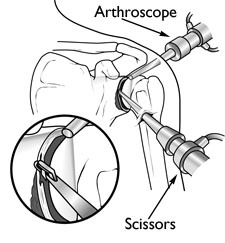 Surgeons can remove bone spurs, repair tendons, or replace the whole shoulder joint if necessary. A frequent tool used in surgery is the arthroscope, a device that has a little fiber-optic camera and surgical instruments. Advantages to using this tool is smaller incisions and faster patient recovery time. The shoulder must be allowed to rest while healing. There is always the chance of a re-tear of the tendon. Sometimes patients need to keep their arm in a sling for four to six weeks. Passive exercise starts four to six weeks post surgery. At eight to twelve weeks strengthening exercise starts. Complete recovery takes up to six months. Massage therapy can help rotator cuff healing at every stage. Call Woodstown Massage Boutique at 856-769-1373 to find out more about it. © 2018 Woodstown Massage. All Rights Reserved.